Japan has a well-deserved reputation as a hiker’s paradise thanks to its rugged mountains, verdant forests and charming trails lined with quaint shrines and mossy jizo statues. And among some of the best known paths to journey on are Japan’s legendary ancient roads, which feature incredible views, living history and important cultural ties. Dating back centuries, these highways have been traveled by everyone from monks to members of the Imperial family, so they’re a great way to really get a sense of the country’s history and culture. The best time to tackle the routes is in the spring or autumn, when the weather is most pleasant. To escape the crowds on more popular trails, try to visit on weekdays and avoid public holidays like Golden Week if possible. If making a multi-day trip, book your accommodation in advance for peace of mind. And most importantly, have fun! Considered the most important of Japan’s ancient highway routes, the Tokaido (which means "Eastern Sea Road") dates back to the Edo Period (1603-1867). It runs along the coast all the way from Nihonbashi in Tokyo to Kyoto’s Sanjo Bridge, passing through seven prefectures in total. Along the way there are 53 "stations" where travelers used to stop and rest. At over 300 miles (480 kilometers) long, the Tokaido has plenty of history and varied views to offer hikers. Don’t worry if the length sounds a bit daunting! You can break up the journey over as many days as you like, staying in hotels and ryokan en route. Another option is to just hike part of it. Because the route passes through—or nearby—several cities between Tokyo and Kyoto, including Shizuoka and Nagoya, it’s easy enough to join or leave the road at any point. One of the highlights of the Tokaido is the section in Hakone that leads to Mishima, which takes you along ancient stone pathways surrounded by forest. The route itself is about 30 kilometers (a little over 18 miles), and split into two sections. The first section starts in Hakone-Yumoto, and goes through Moto-Hakone to the Hakone Pass. The Amazake Chaya tea house provides the perfect pit stop along the way, serving traditional tea, amazake (a sweet, non-alcoholic fermented rice drink) and Japanese sweets to road-weary travelers. You can also visit the reconstructed Hakone Checkpoint—which helped control traffic along the Tokaido—on the shores of Lake Ashi. The second section is Hakone-Toge through to Mishima, and passes by the ruins of Yamanaka Castle (which is now a park), as well as Mishima Taisha, a lovely shrine that is a stone's throw from Mishima Station. Many of the other sections of the road are more urban, consisting of paved paths winding through preserved Edo towns and villages. If the weather is good, you’ll also enjoy stunning views of Mount Fuji along the highway’s middle section. The Tokaido was often featured in Japanese art and literature during the road’s heyday. One of the most famous examples is Utagawa Hiroshige’s series of ukiyo-e woodblock prints depicting the 53 stations along the route, plus the beginning and end points. So when hiking this legendary road, you will literally be walking through a key part of Japan’s history and culture. It doesn’t get much better than that! If you technically wanted to hike the entire thing, the nearest stations in Tokyo are the Nihonbashi Metro Station and Tokyo Station. Similarly, the nearest station from the other end in Kyoto is Sanjo Station. But if you want to hike the scenic route found in Hakone, the easiest starting point is Hakone-Yumoto Station, which can be reached from Tokyo in about an hour via the Tokaido-Sanyo Shinkansen, and a transfer to the Romancecar in Odawara. There are local trains, but they add considerably to the travel time. Keep in mind that some sections of the route are actually trafficked streets—you can walk, but there are also Tokai Bus stops along the way if you'd prefer to ride to the sections of the course that are specifically for hiking. At well over a thousand years old, the Yamanobe-no-Michi has the distinction of being part of Japan’s oldest road, the Shinkaido. Tucked away in a rural part of Nara prefecture, the route runs from Omiwa Shrine in Sakurai to Isonokami Shrine in Tenri, for a total distance of about 11 kilometers (about seven miles). As the shortest of the ancient roads on this list, the Yamanobe-no-Michi is ideal for beginner hikers. The trail is fairly well signposted and remains gentle most of the way, as it meanders through untouched villages and rustic farmland. Overall the walk should take between four to six hours depending on your level of fitness, and how long you want to spend at the various attractions along the route. As such it can easily be completed in one day, but there are plenty of accommodation options in the city of Nara if you want to make a longer trip. Despite its shorter distance, there’s no shortage of highlights along this historic path. The starting point, Isonokami Shrine, is dedicated to a god who dwells in a sword given to the first emperor of Japan. Interestingly, it is also home to a number of roosters who roam freely through the grounds! Further along, Chogakuji Temple makes the perfect midway rest stop thanks to its gorgeous gardens and on site restaurant serving traditional Miwa somen noodles. Alternatively, keep an eye out for local fruit stalls on the trail, where you can pick up the freshest seasonal fare. They use the honor system, so be sure to leave money in the coin box. Also along the route you’ll come across ancient megalithic burial mounds in the shape of keyholes—called kofun—which are said to be the tombs of some of Japan’s earliest emperors. At the other end of the trail lies Omiwa Shrine, which is definitely not to be missed. Said to be the oldest Shinto shrine in the whole country, it sits in a forest at the base of the sacred Mount Miwa. The shrine boasts a rare triple torii gate, plus natural spring waters rumoured to have healing powers—the perfect place to recover from your excursion! The nearest stations are Sakurai and Miwa stations at one end, and Tenri Station at the other. The Nakasendo (which means "Middle Mountain Road") is another of the five Edo-era routes that connected the old capital with Kyoto. Unlike the Tokaido this road runs inland, through the prefectures of Saitama, Gunma, Nagano, Gifu and Shiga. Although both routes are a similar length, the Nakasendo was considered the safer of the two due to the lack of river crossings. As with the Tokaido, you can either tackle the 332-mile (about 534-kilometer) highway in its entirety, staying at hotels en route, or choose to only walk the best bits. If you fancy some company or help with organization, there are companies that hold walking tours of both ancient roads, with accommodation and baggage delivery all arranged for you. These often involve some sightseeing stops along the way, and skip some of the less iconic sections of the roads, which makes it a good choice if you just want the highlights. One of the most popular parts of the Nakasendo is the 4.8-mile (7.7-kilometer) section between Magome and Tsumago, two rest stations in Gifu and Nagano. This route takes you through the Kiso Valley, from the cobbled streets of one traditional village to the next, via rural farmland and peaceful forest. You may be able to do it as a day trip, but to make the most of the journey, you might prefer to stay a night in a traditional ryokan in either village. Both Magome and Tsumago are lined with souvenir shops and local eateries housed in preserved or restored buildings, wonderfully encapsulating the atmosphere of days gone by. 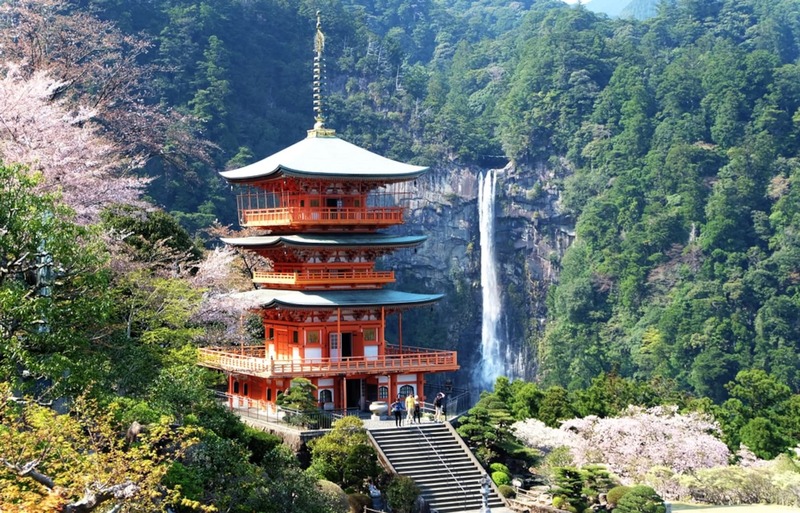 A classical tea house lies roughly halfway between the two, providing the perfect place for a break, and if you have time you can also take the signposted detour to the beautiful Odakimedaki waterfalls. The hike in this area is scenic, mostly well marked and not too challenging, so it's suitable for hikers of all levels and experience. All in all, a great introduction to Japan’s ancient highways, and journey you're unlikely to forget! The easiest way to reach Magome is to walk from the Magome highway bus stop or by taking a bus from JR Nakatsugawa Station. To get to Tsumago the easiest option is to take a taxi from JR Nagiso Station or walk along the Nakasendo Trail section between Nagiso and Tsumago. The Kumano Kodo is a network of ancient pilgrimage trails that criss-cross the forested mountains of Mie, Nara and Wakayama prefectures in the southern part of Kansai. Over a thousand years old, the routes and the three sacred Kumano shrines they link together were designated a UNESCO World Heritage Site in 2004. There are four main trails still in use today: Nakahechi, Ohechi, Iseji and Kohechi, as well as a few others that are more challenging and less frequented. These four routes offer hikes of varying lengths and difficulty levels, with everything from day trips to multi-day treks available. While it is possible to arrange things yourself, an easier option is to go through a company to get help booking accommodation, transporting luggage and so forth. Be sure to bring plenty of food and water with you, as you won’t find any convenience stores or vending machines here! The most popular route for modern pilgrims is the Nakahechi Route, thanks to its good signage, preserved pathways and relative ease compared to the other trails. It runs inland from Tanabe, in Wakayama Prefecture, up into the mountains towards Hongu Taisha (one of the three main shrines of the pilgrimage) via pleasant forest paths dotted with smaller shrines and statues. There are a few picturesque villages along the way with ryokan where you can spend the night. Close to the shrine you’ll spot Oyunohara, the largest torii gate in the world, at 33 meters tall (about 108 feet)! From Hongu Taisha it’s also possible to hike to the other two Kumano shrines, Hayatama Taisha and Nachi Taisha. The latter is home to the breathtaking Nachi-no-Taki waterfall, which is the tallest in Japan at 133 meters (about 433 feet). There are also a few onsen (hot spring) villages in the area, which make an ideal location to soak your weary feet after completing the trek! The city of Tanabe in Wakayama Prefecture provides the best point of access to the Kumano Kodo. The nearest station is Kii-Tanabe, where you’ll also find a very helpful visitor center. If you are interested in the Kohechi route, Totsukawa Onsen in Nara prefecture is a convenient starting point.